Car dealers fear Tesla. In states across the country, powerful car dealer associations have lobbied to ensure the electric car maker and its direct-sales model are kept out. This movement claimed another victory this week when New Jersey banned Tesla stores in the state. On the surface, the fear is hard to fathom. In New Jersey, for instance, sales of Tesla's $70,000 Model S reportedly number in the hundreds. But if you dig a little deeper, it becomes obvious why dealers are worried. They don't just fear Tesla's cars. They fear Tesla’s plan to create a world where you never have to bring your car into the shop again. The first and most striking way Tesla kills the dealer service department cash cow is downloads. As part of its sales pitch, Tesla says you should think of its Model S sedan as “an app on four wheels.” That may sound like vacuous Silicon Valley marketing copy, but the company isn't just being metaphorical. Software is at the heart of what keeps Teslas running. These internet-connected cars are designed to self-diagnose their problems. The vehicles can also download software fixes or updates — even new features — much like an iPhone when Apple puts out a new version of iOS. When fixes happen over the air, there's no need for a shop in the first place. The ability to repair a car via software is especially important when the vehicle itself consists of so much new technology that traditional mechanics don't know how to fix. The flip side is that without an internal combustion engine, there's not as much to fix. 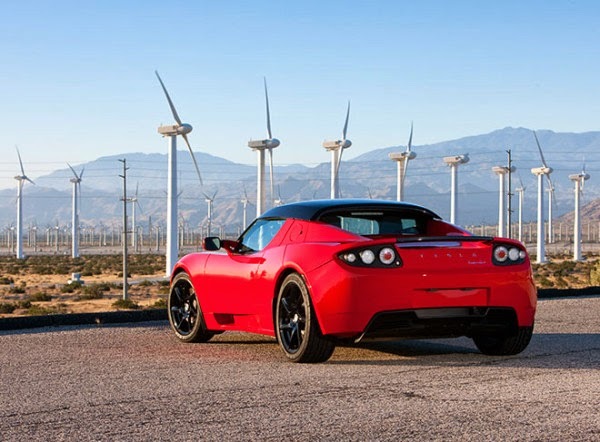 I've written before that a Tesla without its outer shell looks like a cell phone on wheels. It's basically just a big battery. That means no spark plugs, no air filters, no fuel pumps, no timing belts. In short, Teslas don't have any of the parts that force you to take your car in for “regularly scheduled maintenance” — services that can cost dearly at the dealer. But it's hard to charge for an oil change when there's no oil to be changed. To be fair, Tesla isn't doing away entirely with bringing your car in. The company recommends an inspection once a year or every 12,500 miles. Its service plans start at $600 per year* or less if you buy multiple years at once. The plans include replacement of standard parts like brake pads and windshield wipers. The company will monitor your car remotely and tell you when there are problems, such as faulty batteries. In theory, there are pitfalls in an arrangement where the company that makes your car is the only one that can fix it. But Tesla would seem to alleviate that concern with its flat-rate plans, rather than fee-for-service gouging for every fix. What's more, the company says your warranty is still valid regardless of whether you get your car serviced at all. Yes, these all sound like grand promises. And for all we know, Tesla won't be able to deliver on them in the end. But Consumer Reports' decision to name the Model S the country's best overall car suggests otherwise. Even the fact that Tesla is making these promises at all must strike horror in the hearts of dealers. Once presented with the possibility that most of the costly headaches of owning a car aren't necessary, car buyers might start asking dealers why they don't change, too. The answer, of course, is that all those headaches are exactly what keep us coming back to the shop and putting more money in their pockets. At Tesla's most recent annual meeting, one shareholder asked founder and CEO Elon Musk about whether challenges to the company from traditional auto dealers hurt the company's business outlook. The shareholders applauded — the same shareholders that have sent Tesla's stock price up nearly 650 percent over the past year. Yes, for now, Tesla only makes luxury cars, and its approach to service might seem like a luxury. But if it starts making cars regular people can afford, that applause for car dealers could be the sound of money spiraling down the drain.